about 49% of questions have score of 0 or 1.
another 21% of questions have a score of 2. Most questions seem to have an answer or two with score +5. Is it that we have a lot of fluff questions and not useful ones? Or perhaps it just seems more natural to vote for answers than questions? If we want the most useful info on Stack Overflow to filter to the top, how can this disparity be fixed? I think this may cause real problems for people getting the badges which require +25 or +100 votes on questions. The work flow doesn't promote voting for questions the way it promotes voting for answers. One solution: when a user answers a question, the system should invite them to vote for the question. If someone cares enough to answer a question, then they care enough to vote for it as well. Users with less than 15 reputation cannot vote for questions or answers. Is this warranted? Maybe these users could provisionally vote for questions and answers and those ratings would only take effect when the user reaches 15 reputation? All I ask is this. As you browse Stack Overflow, when you see a good question: vote for it. If everyone does, then this problem will disappear. I think this is a usability/motivation issue. You can't vote up questions on the 'index' pages like you can on reddit/Digg/so on, so people aren't going to go 'that looks cool' and vote it up (or vice versa) before reading it. Unless the question is abnormally good or bad, or otherwise provocative, this isn't likely to elicit any emotional response. It's just a question, carry on. The emotional response behind having your answer accepted or upvoted is "I know stuff, I'm smart, I feel good." Likewise, conferring that reward on someone else is quite a powerful thing too. This provides a very strong motivation to rank and provide answers. Because of this motivation, people will put a lot of effort into writing answers (like me with this diatribe) and ranking them. This works very well for providing and filtering good answers, but there's no such motivation behind voting for questions. For most questions, the strongest response they are likely to elicit is "I have that problem too", which while it's strong, is only going to apply to a small portion of the viewers/answerers. While I think this is why questions aren't being voted on as much, I don't think you need to go all out to provide more motivation for it, as this would distract from the main goal of writing/ranking the answers. A simple 'nudge' to remind people to vote on questions I think will do the job without any/many adverse effects. My suggestion for this is simply to make the voting buttons on the question proportionately larger (or make the ones by answers smaller), and possibly change the color or something. After tinkering way too much, I've come to the opinion that there's no great reason for down-voting a question. Remember the old saying "There are no stupid questions" - well, I think that applies here. If the question is too vague, leave a response to that effect (or vote up a comment that states that already). If the question contains a typographic or syntactic problem, edit the question for clarity. If the question is outright spam, or abusive, flag it as such. But down-voting a question? What's the point? If the question is naive you can simply answer it. If you don't like the person who asked it, you might down-vote it. If you don't like the topic, you might down-vote it. 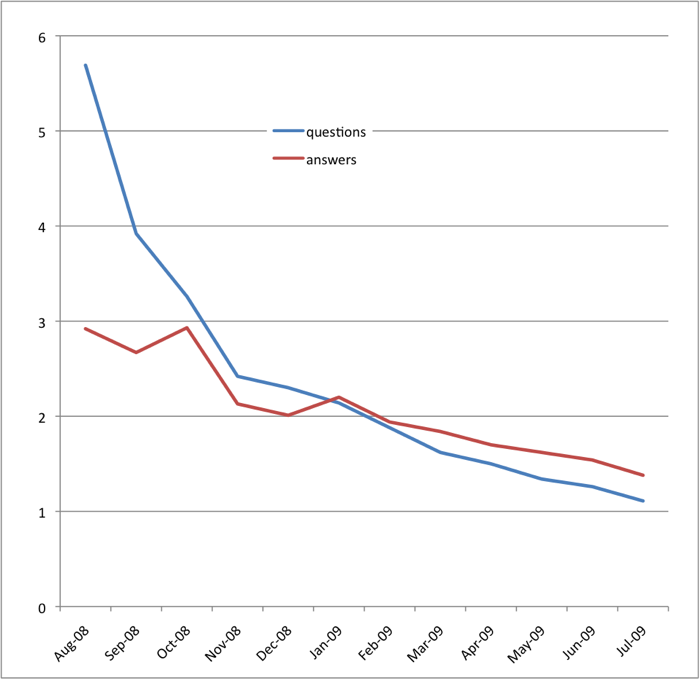 If you don't like the religious or political beliefs of the question, you might down-vote it. Down-voting now attracts a penalty to the down-voter's rep, that's an interesting development, but I think the simpler and more correct variation would be stop the ability to down-vote a question. I actually think this is not a problem, it is simply nature showing us how the system should be designed. In my opinion, there is no reason to rate questions, and we should not try to "fix" it but understand why it is happening. and a possible outcome (the correct one in my opinion) is to do without the voting on questions. Voting on answers is great, but I see no reason for the existence of question voting. Even worse, while the voting is useless (yet harmless), the absolute "evil" baked into the system is the fact that you get reputation when your question gets voted! That is an "evil" incentive to post questions for other reasons beside the ONLY valid reason: you want to get an answer to your question. Giving people incentive to post questions just so they can get reputation is a just as lame as Microsoft giving you "points" for searching using their search.. Motivation for searching should be getting good results. Motivation for posting Stack Overflow question is to get an answer, period. Remember the old saying "There are no stupid questions" -- well I think that applies here. I disagree. There clearly can be, and have been, questions that are pointless or off-topic. If Stack Overflow is to stay useful as an information source and not turn into just another Digg or redit programming section, then there is a need for community policing. I think the system right now is pretty decent. By docking a small amount of reputation for every negative vote cast, it encourages people to be more careful with downmods. Answer votes should contribute to Question votes (Stackoverflow). I agree that answer votes should count towards question score somehow. In that thread, I advocated automatically upmodding a question when you upmod an answer. I believe that this would have the benefits that come from giving a bonus to the question based on the answer score while still giving freedom to vote the question down if necessary. Already, I've run into situations where I have downvoted questions I felt were bad even though I upvoted the answers. I believe that any system where the answers contribute to vote score must take this sort of situation into account, and I feel that the method I proposed would be the simplest way to do it both for the users and for the site developers. I think the "Votes" filter tab on the main page should take into account the up mods for answers in calculating a question's total score. I would like to be voting more questions up, but I still don't have 50 reputation. Also, when you start using the system, you can't vote at all. So a lot of questions and answers might be lacking in votes. It says I must have 50 reputation in order to begin voting. I'd like to be voting up questions and answers now. What about automating it (I'm a programmer ;))? If you answer it, the question is voted up automatically. If you don't think it's worth it, you can vote it down afterwards. Will increase reputation points inflation, but there is always a drawback. I think it's more natural to vote for answers rather than questions. To me, the default reason to vote for a question would be to encourage others to answer it. If it's already answered, so the thinking goes, why not just vote up the answer rather than the question? I don't think that line of thought is the best thing for the site in the long run, but it may be a behavioral issue right now, especially as young as the site is. I think the reason why there is no immediate ability to upvote is to prevent people making lots of sockpuppets and upvoting themselves - enough of that and they would be able to start editing pages and pose a potential problem if there isn't a way of stopping this sort of gaming of the system. The current situation may not be the best solution, but I do think it is better than leaving the site open to that sort of abuse. I agree that one big reason is the +15 reputation restriction to upvote. I understand that since this is a beta, people can come up with a handful of new questions and earn those points quickly, but when Stack Overflow gets more filled with questions, it will become more common that new people come here, search and find the answer they are looking for. And I think finding what you are looking for is totally worth the upvote. Besides, allowing it early would encourage the good practice of searching instead of creating repeated (or re-worded) questions. I've seen many good questions so far that I would like to upvote, but I don't want to just throw a random question just to earn the reputation needed to do that. There is a difference between questions and answers (that sentence alone should warrant a "No s**t, Sherlock!" Badge...). Often, I see questions that are of no personal interest (and therefore not useful) to me, so I see no reason to vote it up. But the answer to those questions maybe useful for me, by giving some additional information that I can use. Or I just think "Whoa, that is some quality content for the site". On the other hand, when the question is useful to me (because I asked myself the same thing) or if I believe that a question is good and very useful, I +1 it, which does happen a lot more seldom than upping answers. At the end of the day, the site is about personal benefit: Whenever an article helps me to gain something that helps me in my work, it gets +1. We are only seeing the positive votes, if we could see both +/- votes it might make more sense. I don't understand the motivation behind down-voting a question. Down-voting an answer I get, but unless the question is offensive or spam or something (and there are different ways to deal with those), I'm not sure why you'd need to down-vote a question. I also don't quite get why you need a +15 reputation to up-vote anything. Well, I know why I haven't voted on any questions. It's because I can't - apparently you need a reputation of 15 just to vote something else up? While I can understand restricting the ability to vote down, a restriction on the ability to vote up seems a little to much - but this is my first day, so maybe I'm just not used to the new system yet. Why people don't vote on questions? Because most questions don't trigger the "oh, that's helpful" response that comes with a good answer. Mostly I guess because questions themselves don't contain much information. I tend to up-vote only questions that are * well written or * where someone has taken the care to aggregate answers into the question or * which I would have had to type up, if they weren't already there. Food for thought: While the number of votes for questions is lower, the ration of up/down is relatively close since the end of the Happy, Happy! Joy, Joy! times of Beta. I upmod things that are interesting to me, that I feel I might need in a future project, that I think would be a valuable FAQ or that I think need a knowledgeable answer to a well asked question. I can't comment on others motivation. I'm going to put a vote in agreement with everyone else in that the reputation required to up-vote a question might be hurting the system a bit. Personally, I tend to also up-vote questions that I think are interesting or that I would like to know the answer to as well, but that is generally when there aren't many answers to the question yet. Once there are more answers to the question I tend to up-vote the answers instead. One thing that I think might be useful in causing more questions to be up-voted is what others have suggested in lowering the bar for when you can start up-voting questions; however, I would go so far as to say as soon as you have 10 points (i.e. one good question or answer worth of up-votes) you should be able to up-vote questions. Then the bar for up-voting the answers could be moved up a bit to say 100 points or so. However, one thing that might be skewing things a bit is the member base. I'm not sure of the exact numbers of users; however, I have started to notice some common names in answers and it might be that the lack of a broad user base is hurting this part of the beta. I know that I personally tend to ignore questions that I know there is no way of me knowing the answer to so I wouldn't be surprised if other users might be doing the same thing. If you look at the questions with the most up-votes, they tend to either be related to the site itself (i.e. tagged with stackoverflow) or tend to be broad base fundamental topics that everyone would likely be familiar with (i.e. tagged language-agnostic). This is definitely something that needs to be monitored, but I am quite curious to see if it starts to resolve itself a bit as the user base increases. I seems quite likely to me that both questions and answers will follow distribution that approximates a power law. I have no justification for this option, but I thought I'd throw it out there. It's likely that the set of programming questions that are seem as most relevant to everyone is a fairly small subset of all the questions that get asked, unless the community is very homogeneous. Each question is likely to have an answer that is viewed as being the best - if I view question which already has a good answer, I'm more likely to upmod the answer that add my own answer to the question. Many questions address a very specific problem and the answers are not helpful to the casual reader. While we can still recognize the correct/helpful answers to those questions, we do not judge the question to be 'good' or 'bad'. The question just 'is'. I'm not sure what would constitue a good question. My answer would be: a question that evokes discussion, because it draws attention to something that software engineers should investigate. However, that is just the kind of question for which this website is not intended. There are no good questions, only good answers. Maybe the quality of a question comes from the sum how many people answered it and how many people rated the answers? I try my best to vote for anything I think is helpful. I think that seeing both up and downs (as kevin d suggested) is a good idea but I would suggest making it so that when you someone up-votes something you up-voted, you get 1 point. I tend to upvote questions when the answers are generalizable, or the problem is a question whose answer has implications for a lot of other problems. I do this so that when I look at tag, say python, then the questions I see will be ones that are almost guaranteed to have relevance to *me, for many values of me. What is question upvoting really supposed to be for? I would only vote for question that makes me think: Gee, I'd like to know that too. However, I yet to run into such question. I guess it's the same for most other people. You usually reply to question others don't know, but you do. Also, it says 'this was helpful' when you hover over a question, which does not make much sense. Answers can be helpful. Maybe something like 'this is interesting' or 'this is a good question' would be much better. I know this is a very old thread which was started when SO was still in beta. However, after reading through all of the 51 answers posted here by the time I'm writing this, I had the feeling, that my answer wasn't here yet. Reading the answers brought me to the conclusion that there is a great consent on why to vote for an answer (i.e. promotion of good answers as well as giving credit to the users who provided them). However, there's quite an amount of different opinions on why to vote for questions or whether to vote for them at all. ...find it more natural to vote for answers than for questions. ...see no benefit in voting on questions. Several answers to the same question are comparable amongst each other and voting for answers brings the good ones to the top. However, voting for questions is considered comparing apples and oranges - it just makes no sense. ...believe attributing reputation to someone for not knowing something is inherently wrong or that at least the amount of reputation gained through an upvoted question should be substantially smaller than that gained through an upvoted answer. Regarding 1., there didn't seem to be much reasoning, so I'm not inclined to reason myself in order to refute these opinions. Regarding 2.: If people vote questions up that they believe are worth asking and that are well written (SSCCE, good english, good formatting), then a questions score would be a measure of quality. This would help to bring high quality questions to the top of the search results and hide less well crafted questions. If that's not a benefit, then what? Regarding 3., I do understand and to some extent even share this opinion. But I find it important to distinguish reputation and vote count as two completely different concepts that aim to achieve different things. As already stated, vote count (whether on questions or on answers) is supposed to reflect quality. Reputation on the other hand, is a measure for the merit of an individual. For the individuals the reputation has value, because it is something they can brag about or that they may even be able to use when applying for a new job. Because it has value, it is a good instrument to stimulate participation. However, the possibility of gaining reputation from asking questions somehow lowers the value of that reputation. Where's the merit in asking a question? Imagine you're looking at an answer posted by a 60k rep user and you think "Whoa", but then you look at his profile and you see that 90% of his rep came from questions. For me that makes a difference. Conversely I'm not too impressed by people who pretend to know everything by never asking any questions. It just shows off their level of narcissism. Another problem I see with the tight coupling between votes and reputation is that questions that address more common problems will create a higher traffic than those with a very narrow domain. Questions with high traffic and their answers are more likely to get upvoted than those with low traffic. This is not a bad thing by itself, but because upvoting creates reputation I see lots of people accumulating insane amounts of reputation for explaining very basic principles of programming while others who provide sophisticated answers to quite complicated problems receive very little reputation for doing so. I'm not trying to discredit anybody or saying that reputation scores are meaningless, but because of how the system works I believe that they are distorted and not easily comparable. Coming to an end now: It's too late for that, but if I could make a substantial change to the way SO works, I'd completely decouple votes and reputation. Instead I'd attribute some sort of credits to people depending on their level of participation on this site. These credits wouldn't show up anywhere on their public profile, but they could spend them on other users to increase their reputation. It would become clearer to users what they achieve by voting for questions (better search results) and they would be more inclined to do so, because there's no reputation change involved for the person asking. Thus we would see more questions being up- or downvoted. It would increase the comparability of reputation scores and the scores would better reflect who's actually reputable in the community. I know that this would be a fundamental change to SO and its siblings and that there's no chance for it to ever become reality, but perhaps someone will read this before launching the next Q/A site and hopefully consider it a reasonable suggestion. I would have up voted several things in the past 20 minutes if there wasn't a silly reputation restriction on up votes. I can understand down vote limits, and an can understand a probation period, but it shouldn't kick in automatically it should be applied when your reputation drops, not when you're first starting off. Now the initial impression is "Why did I just register? I can't do anything." It will also lead to far more duplicate answers because I can't easily say "I agree with this existing answer." I either have to post my own 90% similar answer, or say "@johndoe I agree" which doesn't elevate the answer in the rankings, requires the reader to parse and scroll back to see what johndoe said, and gives johndoe no benefit from their good answer. The answer ratings have a graphical interpretation. The little up-arrow pushes the answer up the score-scale, and thus up the page; and the down arrow pushes it down the score-scale, and thus down the page. That a question has a score of 20 vs 200 vs 2000 doesn't tell me anything, as there is no implied comparison with other questions. I have to think about the meaning of the question voting widget every time I see it, as it does not intuitively mean anything. I would suggest that the question's rating (for whatever purposes that rating has) be inferred from the answer ratings. Maybe the question score could be the sum total of all answer votes. Inferring from the number of answers is less attractive, as some answer sequences are actually conversation threads, and do not reflect on the quality of the question. I call Benford's Law on the voting distribution. Couldn't it automatically infer the value of a question by other metrics like # of answers and # of up votes on answers, # of views, etc. Answers that are voted up are usually deep answers, but they typically require a deep question. Don't they? Let's turn to the DB to find out. Why should I upvote a question? Why have we stopped voting up interesting questions? Why do (some) answers get more votes than their questions? Why do people vote more on answers than questions? Why do answers to good questions always get a higher score than the question itself? Do you ever not upvote a question that you answer?